Did you enjoy the teaser for the Day 2 installment? I hope you did, because that's the only art you'll be getting for a little while. I'm a little limited in cartoon supplies here at the hotel. But Day 2 is a tale of epic proportions. It's a tale of discovery, a tale of magic. It's a tale of heartbreak, tragedy, and misfortune. So let's get down to it. Day 2 was the designated Magic Kingdom day. It was yesterday. But I was too tired to write about it yesterday, so I sketched out a quick doodle with the hotel pen and notepad and then I hit the hay. 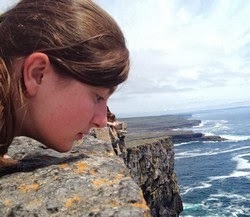 But we definitely had some adventures that ought to be recounted. We got to check out New Fantasyland, which really is something special. The Ariel ride is cute and fun (the "Under the Sea" part rocks and the Ursula animatronic was mildly terrifying) and there's a TON of Beauty and the Beast stuff. Beauty and the Beast is my favorite Disney movie ever, so I was pretty giddy. There's a gift shop (naturally), Gaston's tavern, Belle's cottage (my inner little girl longed to go listen to Belle read a story), and the Beast's castle. ...blew me away. The ballroom looks JUST. LIKE. 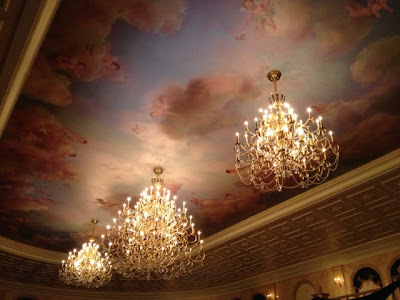 the ballroom in the movie. Aaaaah! There's even snow falling out on the balcony. How beautiful is that? 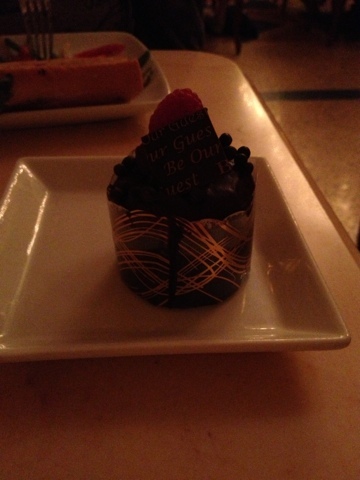 It's just so decadent and wonderful... "Be Our Guest"? You don't have to ask me twice! Just look at that dessert. LOOK AT IT. It was delicious, and there were a ton of other cupcakes to choose from as well. The entrees were mostly French (or French-sounding). I had a croque monsieur, which is like a hot ham and cheese sandwich. It was tasty. The service was pretty good. You order and pay for your food close to the entrance (you know, after you walk across the stone bridge and through the hall of talking suits of armor) and then you find a seat. The staff give you a red disc sort of thing with a rose on it (naturally), which you take with you to your seat. Some liveried waiters track your table down using the locator in the rose disc and deliver your food on large trolleys. It's fantastic. 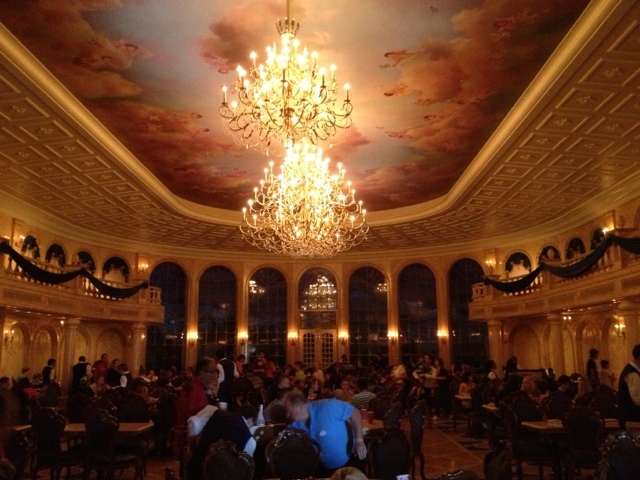 The ballroom was the best dining room of all, but there were also two side rooms available. One, I believe, was supposed to be like Belle's enormous library, but instead of books, there were gigantic "portrait" stills from the movie. In the center were the rotating figures of Belle and the Beast in their famous ballroom dance. The other room was the West Wing, and it was delightfully spooky. It was dark, had ripped-up decorations, and even had a portrait of the Beast in his human form- complete with slashes and claw marks in the canvas. Wonderful. We had a good time in the Magic Kingdom, although some members of our party got tired faster than the others. Since we had already done just about all of our favorite attractions, my mom and sister went back to the hotel around 3:30, after my dad clobbered us all at Buzz Lightyear's Space Ranger Spin. My dad and I stayed behind to catch up on a few last attractions and watch a parade. We found a pretty nice location on Main Street about half an hour before the start of the parade and got comfortable to wait for a while. We chatted about stuff. After a little while, I felt a strange thump on my head, as if a large insect had crashed right into it. An immediate reaction from someone standing nearby corrected that theory, much to my dismay. Bird poop. A bird had swooped down and let loose on my dad and me. I had bird poop in my hair. Disgusted and appalled, my dad and I all but ran to the nearest bathrooms we could remember seeing (in Tomorrowland). I'm sure I was bright red the entire way there. The whole time, I was thinking, "Don't look at me. Don't look at me. Please don't look at the bird poop in my hair. Please, please, please don't stare at me. I can't believe I have bird poop in my hair THAT IS SO GROSS!!!" When I finally made it to the restroom and fought my way through the slowly-moving people who seemed as if they were having a very hard time deciding which stall to go to, I discovered that there was an alarming lack of mirrors. So I held a wet paper towel in one hand and my iPhone set on its camera mode in another and tried with difficulty to wipe the poo out of my hair. I had trouble finding much, which was alarming. It was a pretty solid thump, after all. After a moment, I found it. It was on my brand new silver-sequined Mickey Mouse head hair clip. A wide range of emotions filled me at that moment. Dismay at losing the hair clip (there was no washing that; I would never get all the bird poop out of the sequins), bittersweet pride for the brave and loyal hair clip that had given its life to protect my hair, but most of all amazement at how the bird had managed to hit that one small spot on my head. I threw the hair clip away, wiped out whatever was left in my hair, and then rejoined my dad. We decided that prompt showers were in order, but since the parade was due to start in just a few minutes, we might as well stay and watch it. The parade was nice. I love Disney parades; it always makes me giddy to see my favorite characters rolling down the street on a float, and the music was fantastic as always. I think the name of the parade was "Celebrate a Dream Come True." I'm all for that. However, as soon as the parade was over, my dad and I were anxious to get back to the hotel and hop in the shower. We did so, although when we got there and I finally found a mirror, I noticed something to top off the misfortunes of my day. You see, I had an idiot moment. I went outside for several hours at a time while in the state of Florida and I didn't put on any sunscreen. So now I have sunburn all across my nose and cheeks. Owwwww.